After a full day of rest, some of our Rotarian partners from RC Makati Southeast and I visited the Cardiac cath lab of the Philippine General Hospital. 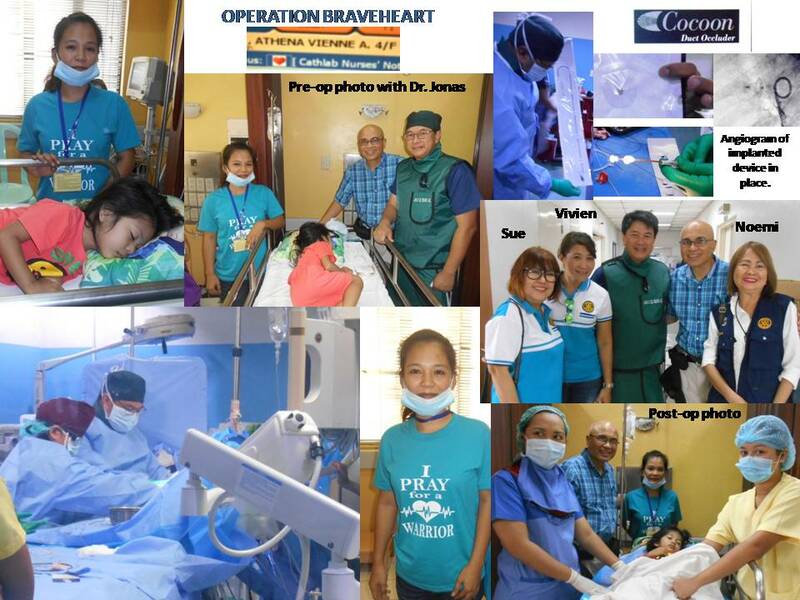 We were expected by Dr. Jonas del Rosario, our volunteer doctor who repaired 33 indigent "Braveheart" children with hole-in-the-heart defects. My wife Luz and I, asked him to schedule three more children during our visit since we raised additional funds outside of the global grant AND we wanted to witness the procedure first hand. My wife had to be with her family so I had to go myself. Vivien, Past President of the RC Makati Southeast Club picked me up at our hotel together with Past District Governor Sue. We met another Rotarian, Noemi at the hospital. On the transcatheter repair schedule was ATHENA, a 4 year old girl from Cagayan, way up north in Luzon. She was referred to Dr. Jonas by a physician in the province where they do not have the facility or capability to repair her PDA (Patent ductus arteriosus). The family is poor but they were helped by a support group, "Pray for a Warrior," (see her Mom's shirt). The group provided her with the means to bring Athena to Manila and funds to pay for temporary living quarters while they are in Manila. Athena was already sedated when we arrived so I never had a chance to talk to her or take a good picture of her. This patient was sponsored by our newly-minted internist son, Dr. Eric Socrates. Instead of giving us Christmas presents, he gave us a check to cover the expenses needed for the repair of one child. Athena's mother was most appreciative of all the help a lot of people and organizations have given her to facilitate the repair of her daughter's heart. She was shedding tears of joy after Athena's surgery. I suppose this is how all the parents of all the 33 children we have reached through Operation Braveheart feel. Dr. Jonas welcomed us to the cadiac cath room so we could watch the entire procedure. He showed me the device that he was about to implant into Athena's patent ductus arteriosus in order to close it. It's on the collage - the extremely tiny device is mounted on a tip of the delivery catheter. It is like a tiny umbrella that is collapsed when it is introduced into the femoral vein and threaded towards the heart. When close to the target (the patent orifice), the device is opened and manipulated to make sure it is properly positioned for optimal closure. You can see the device in place on the angiogram. Dr. Jonas demonstrated to us on the monitor how the dye that flowed through the PDA before closure is no longer flowing through after the procedure. Athena is now cured of this defect and will live as normal as her peers are. Multiply this experience 33 times over - this is how our Club's Operation Braveheart has touched the lives of so many children and their families. Thank you everyone for your support of Operation Braveheart.